Are you planning to create a WordPress site for your photography business? Having a site is important to have control over how your photos are shared online. In this guide, we will share the 22 best WordPress plugins for photographers that will help you create an amazing website. Photographers share their work online on multiple platforms to get fan following and clients. While social media can be helpful for promoting your work, it’s important to have a website you can leverage to get clients and build your business. Your photography website should be strong in features and performance. First thing that you need to do before creating the website is to buy a domain and hosting. You should select the best web hosting for photographers for your site. Now after choosing your hosting plan, you should simply follow our step by step guide to create a photography website in Worpdress. There are thousands of WordPress plugins available, but to save you time on research, we filtered the best photography WordPress plugins for you. Image gallery and slider plugins are the most important features for a photography site. These plugins will help to display your photos beautifully in WordPress. 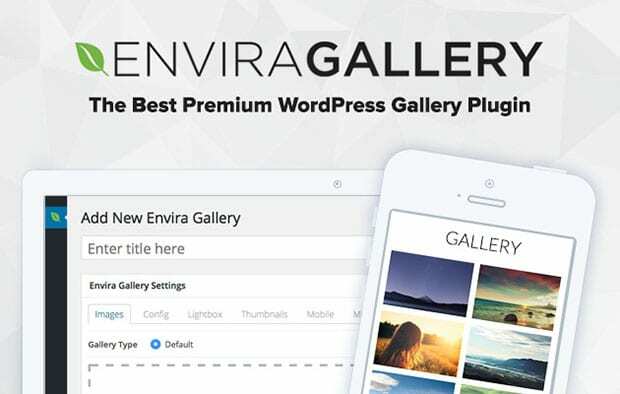 Envira Gallery is the best responsive WordPress photo gallery plugin. It will enable you to create beautiful and professional galleries that look great on all devices out of the box. Envira comes with more than 25 different addons to help you create the most beautiful image gallery using WordPress. You can import your pictures from Instagram, Dropbox, and variety of other sources. Envira Gallery is SEO friendly and helps you get discovered in search engines, and keeps your WordPress site loading fast. It comes with image gallery widgets, shortcodes, eCommerce integration, pagination, deeplinking, and much more. Soliloquy is the best WordPress slider plugin in the market. If you’re looking to add an image slider on your photography site, then you need to use Soliloquy. It comes with tons of features such as slider themes, dynamic sliders, video sliders, various style of animations, importing abilities from Flickr, Instagram, and much more. Soliloquy image sliders are fully responsive, fast to load and work great on all devices. Check out how to create an image slider in WordPress to see how it works. Storyform helps you add stories to your photos in a unique style. You can add it to a post, and it will turn the post into a photo-essay for you. This feature rich plugin comes with full-screen responsive magazine layout, multi-column content space, large photography, animations, captions and much more. It supports mouse and keyboard shortcuts. If you want to attract visitors by telling them the stories behind your photos, then Storyform is a great plugin to use. WordPress posts and pages have the ability to add tags and categories to filter them for users. However, there is no default system of image tagging for your photos. WP Media Tagger is the best plugin to add tags to your images, so your visitors can easily navigate to the right set of photos. You should check out this guide on how to tag images in WordPress with WP Media Tagger. If you are a Envira Gallery user, then you can use tags to group photos and organize them in WordPress image galleries. Photographers should be concerned about the security of their photos when sharing online. It’s not easy to fully secure your images online, but there are few plugins that make it possible to a great extent. As with any business, security is essential for your photography site. Wordfence Security is one of the free WordPress plugins for photographers that helps secure your website. Wordfence first analyzes your website to see if you have been previously hacked by scanning your server and source code. After that, it implements security measures to protect your site from known risks. Theft is a common problem photographers deal with online. Easy Watermark is a free watermark plugin for WordPress that can help reduce image theft. It automatically adds your watermark to all photos uploaded on your WordPress website. You can also add or edit any watermark manually. If you’re using Envira Gallery, then you won’t need a separate plugin for watermarking. Instead, you should check out his guide on how to add watermark to images in WordPress with Envira Gallery. When you upload a lot of photos on your site, it may slow down due to the image sizes. Also large images will take time to load on screen. This slow loading site can annoy your site visitors, and it effects your search engine rankings. Caching helps you speed up your website which helps rank higher in search. W3 Total Cache helps you reduce load time of your web pages. You should read more about WordPress page caching to find out how you can get started. With more than a million trusted users, W3 Total Cache performs great in all categories. If you are a photographer and using a lot of images on your website, then this plugin is a must. As a photographer, you may love large, uncompressed images. But that’s horrible for your site speed. Imsanity is a resource to free yourself with the headache of compressing images. Simply drop the photos of any size, and Imsanity will take care of it. You should also check out these 9 free image compression tools and also learn how to optimize your images for the web. Lazy loading speeds up your page by only loading the images that are first viewable to the visitor, so they don’t have to wait for every image on the page to load at once. Lazy Load plugin for WordPress is a perfect solution to save your server bandwidth and improve the page speed. It only loads the content when a visitor scroll down to it, and if the user never scrolls down, then that content is never loaded. For the Envira Gallery users, lazy loading is built-in to create lightning fast galleries in WordPress, so there’s no need to use a separate plugin. A content delivery network (CDN) is a smart process to increase the speed of your website by distributing your content across the globe. You can check out this infographic to see how CDN works. CDN Enabler plugin helps you integrate a CDN with your WordPress website. It integrates with KeyCDN, but if you’re using other providers like Amazon, MaxCDN, Rackspace, etc then you should just use W3 Total Cache because it comes with a CDN module. Every site owner wants more visitors to expand their reach. Photography websites can rank higher on search engines and get more visitors if the right plugins are used to optimize the sites. SEO is important for your photography website, and there isn’t a better WordPress SEO plugin than Yoast SEO. It runs on millions of websites, and is by far the best solution in the market. Yoast SEO comes with tons of features including page title, meta description, focus keywords, sitemap, social metadata, and much more. You should check out this guide on how to install Yoast SEO in WordPress to get started. PrePost SEO checks your content for plagiarism, grammar, spelling mistakes, broken links, keyword density and more. For photographers, it also checks for the image alt tags and optimizes them for search engines, so your photos can rank faster. Aside from that, it checks the status of links for do-follow or no-follow, analyzes metadata, calculates keyword density, and gives suggestions to improve your photography website ranking. MonsterInsights helps you monitor the traffic on your WordPress website. It shows how your visitors interact with your website and provides essential data that you can use to improve. This plugin eliminates the need of using the much complicated Google Analytics interface, and makes it easy to set up Google Analytics on your site. There’s also a pro version of MonsterInsights that includes even more features, including ads tracking, ecommerce tracking, custom dimensions tracking, popular post tracing, events tracking, and tons more. Since photographers shoot a lot of events, it can be a life saver to have everything managed within your site. You can add the event scheduling, image proofing, and invoicing features to reduce your efforts. Dialing phone numbers to book appointments is a thing of the past. BirchPress Scheduler allow your website visitors to book appointments online. It shows your availability and also offers payment integration, so your photography clients can easily make an appointment on your site. Picu help you get your photographs proof-read by your customers on your site. Simply create a collection of photos and send the link to your customers via email. When the client approve the photos, you will be alerted by email. This is a perfect WordPress plugin for photographers. Just take photos, upload them and get the approval. For Envira Gallery users, we have added client proofing feature, so there’s no need to use another plugin. WP-invoice help you create beautiful invoices and get paid. Send the bills of your services to your clients online using your website. They will receive an email with the link to pay with PayPal or credit card. For photographers, it will save a lot of time to manage payments online. Social media sites plays an important role in getting visitors on your website. It is recommended to share your work on these channels using the social media plugins for photographers. Floating Social Bar is a complete solution for all your social media needs on your site. It’s a lightweight plugin that floats with the scroll of your page and attract more visitors to share your content. Photographers can use this plugin to share their photos on multiple social media channels. It supports major social media networks like Facebook, Twitter, Pinterest and more. Pinterest is a great tool for sharing photos. Pinterest Pin It button adds the Pin It button on all the photos of your website. You can choose to manually add it to individual photos as well. This social media channel is a great place to share your photos on different boards and expand your social media reach. Envira Gallery also comes with a Pinterest addon that allows you to add the Pin It button to all your gallery images individually. TweetThis Shortcode plugin allows you to add tweetable quotes in your blog post. You can create picture quotes to share your photos on Twitter to attract more visitors on your site. You have probably seen these attractive quote boxes on popular media sites. When your visitors click on it, a pre-made tweet will be ready for them to post with a link to your site. In today’s age, almost all photographers have an Instagram account. Simply Instagram brings all your Instagram photos to your website with just a few clicks. You can also display the trending photographs of Instagram from other users. Envira Gallery also has an Instagram addon that allows you to selectively import photos from Instagram based on your tags and other parameters. After all efforts of promoting your photos online through SEO, social media, and marketing plugins in WordPress, you should have a strong communication process with your clients and visitors. We recommend you to add contact forms, newsletter signup forms, optins, and more, so your audience will have a variety of options to get in touch with you. No website is complete without a contact form. 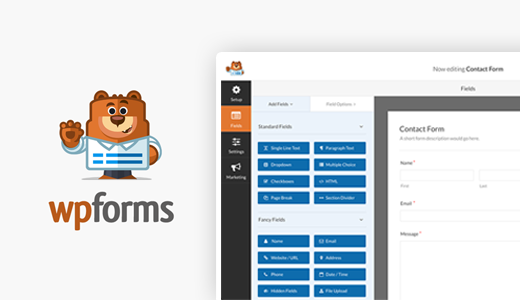 WPForms is the most beginner friendly contact form plugin for WordPress. This drag & drop online form builder allows you to easily create contact forms, email subscription forms, order forms, payment forms, and other type of online forms with just a few clicks. We use it on Envira and on all of our sites. There’s a free WPForms Lite version available for those who are looking for a simple solution. If you want more advanced features, the Pro version is a smart investment. You should check out this guide on how to add a photography client booking form in WordPress and start listening to your visitors. OptinMonster is the best plugin to grow your email subscribers. You can create multiple optin forms such as lightbox popup, scroll-triggered slide in boxes, floating bars, after post forms, sidebar optin forms, and more. These optin forms will help in converting your abandoning visitors into customers. You can see this beginner’s guide to email marketing to learn how to get started. OptinMonster allows you to do behavioral targeting using exit-intent and page level targeting. That’s all. We hope this guide has helped you find the best WordPress plugins for photographers. You may also want to check out list of 57 best free WordPress themes for photographers and read about common WordPress errors and how to fix them. If you like this guide, then please follow us on Facebook and Twitter for more free WordPress resources and tips. the most annoying error of all is maybe 500 internal server error, you never know when it hits you and frustrate the hell out of me to fix.